Starting years ago teaching classes and schools with some of Oregon’s finest instructors his ongoing love of fly fishing is evident. 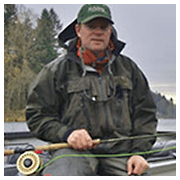 Rob has been a licensed Oregon fishing guide since 1992, who grew up on the banks of the Clackamas River. 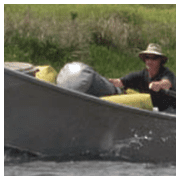 You may have seen him on a number of different shows with Flyfish TV or Columbia Country TV. Rob is also the past editor of Flyfishing & Tying Journal magazine. Guiding, teaching or tying flies Rob loves to share his knowledge with others passionate about the sport. 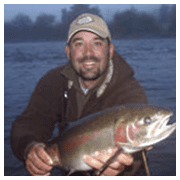 Being born and raised on the banks of the Rogue River in Southern Oregon fueled Todd’s passion for the outdoors. Fly fishing, hunting, camping and whitewater were a way of life growing up. 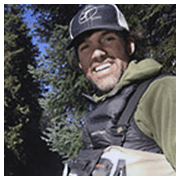 In high school Todd began guiding whitewater inflatable kayak trips in Oregon, Idaho and California. Todd is first aid/cpr/swiftwater rescue trained. Todd is married to his wife Angie of 27 years and has two grown sons Alex 25 and Mitchell 22. Todd’s love for the outdoors runs deep; guiding others into outdoor adventures is something that brings him great enjoyment. Gil is the guide who makes you feel right at home in his boat. Fish with Gil and you’ll leave the river knowing you’ve got a new friend. 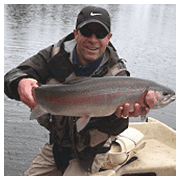 An excellent and patient instructor Gil teaches both single hand and spey casting. Years of fishing time on the water combined with a passion for fishing and you’ll think he can read the mind of fish. Whether it’s trout or steelhead Gil is as good as it gets. Kenny grew up on the banks of the Clackamas River in northern Oregon chasing steelhead is in his blood and he has made it his life pursuit in every aspect. Kenny is also an accomplished class V rafting and kayaking guide and other than his home rivers in Oregon you’re likely to see him on the mighty Zambezi When Kenny is not guiding he is fishing, honing his spey cast or hard at work in his shop making custom wooden paddles and oars under his brand, Blunt Family Paddles. Kenny always has a smile on his face and is regularly requested as a guide for our returning guests. Marty Smith runs the camp for Water Time Outfitters. Marty is also known as “Superman Marty Smith” with a long time reputation as one of the best gear boat men on the river, Marty knows how to create the comforts of home on the riverside. After years in a professional career Marty now chooses to spend his time on the water. He’s trained in search and rescue, first aid and of course was an Eagle Scout.